One of the great perks of the new and updated website is that people get the chance to see what I do and what I am all about. I have had many people in my life tell me that my personality has come through on the website. I have also had many people whom I have never met say that the website has an inviting feel and that they felt like they got to know me just from reading the pages. Finding my webpage is actually what brought me and one of my recent clients, Rodrozen Designs together. They recently had a breakfast event where people in their industry were invited into their store; I played and sang as the guests mingled. If you need any kind of design or renovation for your home, office and beyond, these are your guys! They have beautiful art work as well. I absolutely love performing in this setting. 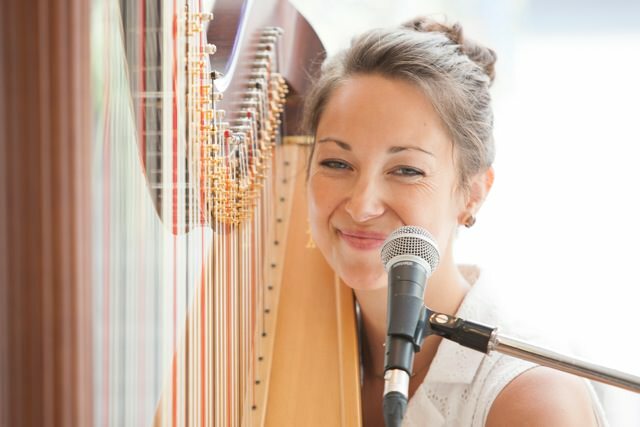 I get to share my singing and the beautiful music of the harp, all while playing a diverse set of music and meeting many new people . I am doing what I love and am so happy that my website is helping to spread the word all around Vancouver! To keep it accessible for everyone I try to incorporate: standards, some pop stuff, a little classical and even some of my own songs. People are always surprised by the versatility of my music and the many places in which I play: events, fundraisers, parties and beyond. They are often taken aback by the fact that I am not a stuffy musician but I bring humour and fun to my gigs. The wonderful photographer for these shots was Mark Whitehead from gettheshot. He has some amazing photos! 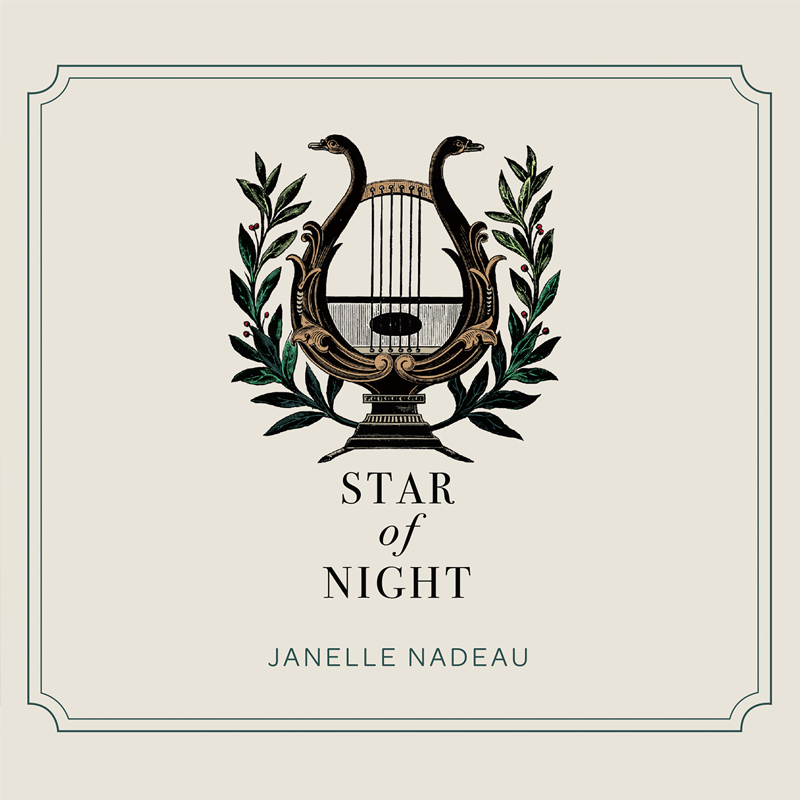 If you know of someone or a company having an event, this kind of music would definitely add that “je ne sais quoi” feel as harp music fills the air! Need a musician for hire?- contact me! One of my dad’s first memories of me as a baby was bringing me back to the farm in the car seat of his brand new Versatile 800 tractor in a blinding snow storm. Needless to say, I have grown up on equipment and it gives me as much peace and serenity as playing my harp does. A lot has changed in the the last 27 years. The old Versatile was retired years ago and now so much of the equipment is run electronically; even the steering! 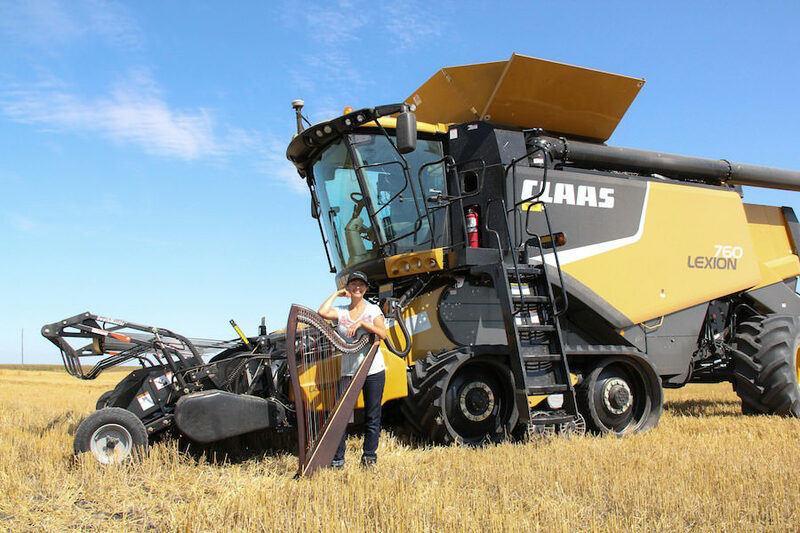 My favourite piece of equipment to drive is the combine which is in the picture below. 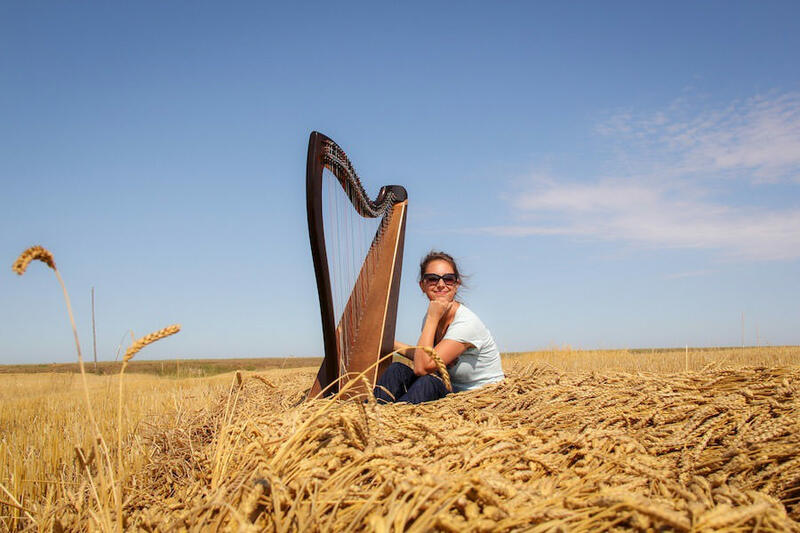 The day that we harvested that field, the wheat was not quite ready to go so I dragged my harp into the field with my mom and sister and we took this video. Hours on the farm are more intense than most people imagine. Not only is the whole family involved in working on the farm, but the hours are long and the work is unpredictable; you never know when a rain cloud will come your way or the field will be ready to harvest. Still, nothing beats a meal in the field which makes it all worthwhile. Every year, it pains me to come back to Vancouver and leave the farm but once I get back, I do love my life here as I am so fortunate to be a working harpist in this beautiful city. Don’t worry though, I always go back! Once upon a time, there was an eleven year old little girl who played her harp at her Aunt and Uncle’s wedding. She then got asked to play at another wedding, then another and soon she found that she was playing at weddings every weekend and she loved it. Fast-forward 15 years and that little girl is all grown up and is still enjoying playing the harp at beautiful Vancouver weddings. 2. The dress: When a bride-to-be tries on her dress, she should also pause for one moment and figure out if she can comfortably move in it. If there is one day where a girl should be free to throw her arms in the air, jump up in excitement, or wipe a tear from her eye, this is it! 3. Wedding Planner: The wedding is about the couple but the couple would not be the individuals they are if it were not for the love and support of family and friends. If there are enough details, do everyone a favor and get professional help the day of so everyone can relax and enjoy. 4. Hire a harpist! : There are very few instruments that spell “romance” as much as the harp. Treat yourself and your guests to beautiful, live music that will create that unforgettable touch on the day of your dreams. 1. Don’t touch my harp. 2. I said, don’t touch my harp. 4. I can move my harp by myself. 5. No, I don’t wish I played the flute. 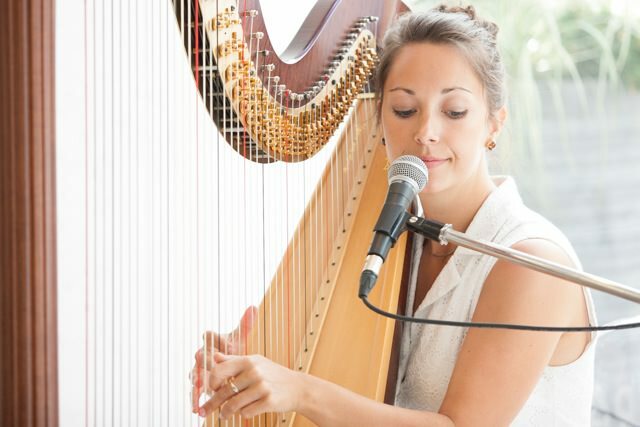 When I was in high school, and I was deciding “what am I going to be when I grow up”, I knew that the harp was going to play a big role and I knew I was the type of person who needed to have my hands in many different pies in order to stay inspired. 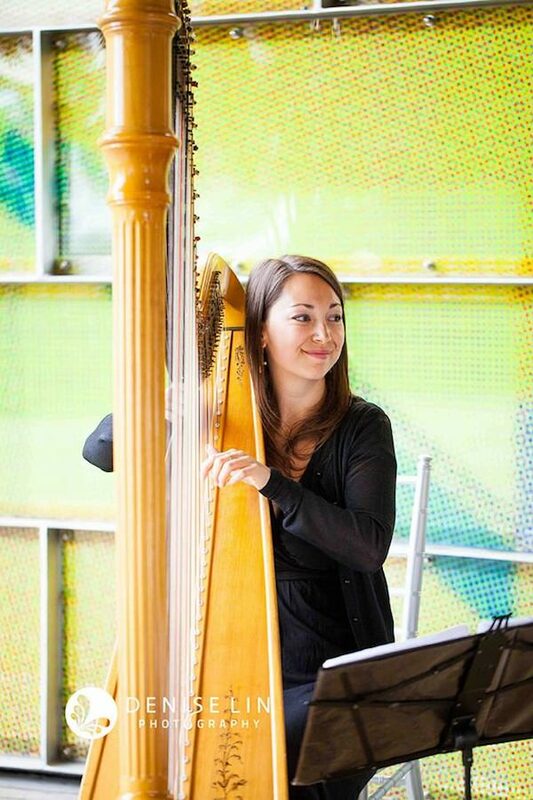 Little did I know that becoming a professional harpist would keep me occupied in so many different ways. 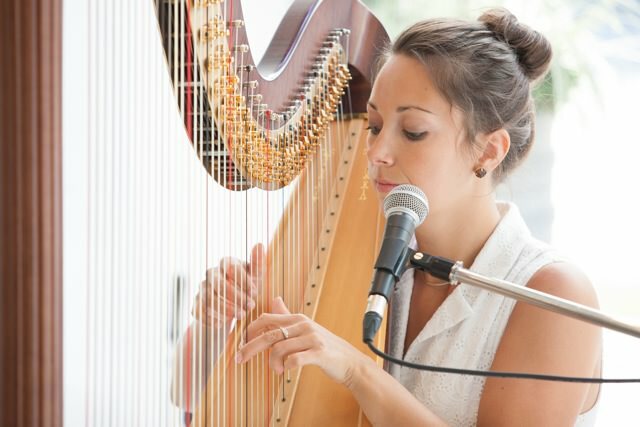 My job is so diverse as I mainly travel around the Lower Mainland, but especially in Vancouver while playing my harp. I have met amazing people, I get to hear their stories, I get to be creative musically and visually, I get to do the business side of things and most importantly, I love what I do. Another great perk about being a musician is that I get to work from home quite often. I love being home and having that freedom. All in all, I wouldn’t change it for the world. I love my job. I love being a harpist. I love Vancouver. And I love my harp. I am so happy to finally have it up and running and that you are here visiting! My team and I worked really hard to create a site that is comprehensible, has lots of information, and is fun. I wanted to construct a website that people could check out on a regular basis and stay connected to my music, videos, information and to me. When it came to designing the site, my designer Jessica and I tried to figure out how it would be possible to put all the information that needed to be here in the most efficient way. Then we needed to figure out what the look of the whole thing was going to be. I had been told that the most successful people in blogging and social media are the ones who stayed most true to themselves. I am IN LOVE with the vintage-shabby-chic look and my house is full of these kinds of pieces. We felt like this look of the website was very much that and I loved the beautiful 1930’s inspired floral design. This is what we came up with! 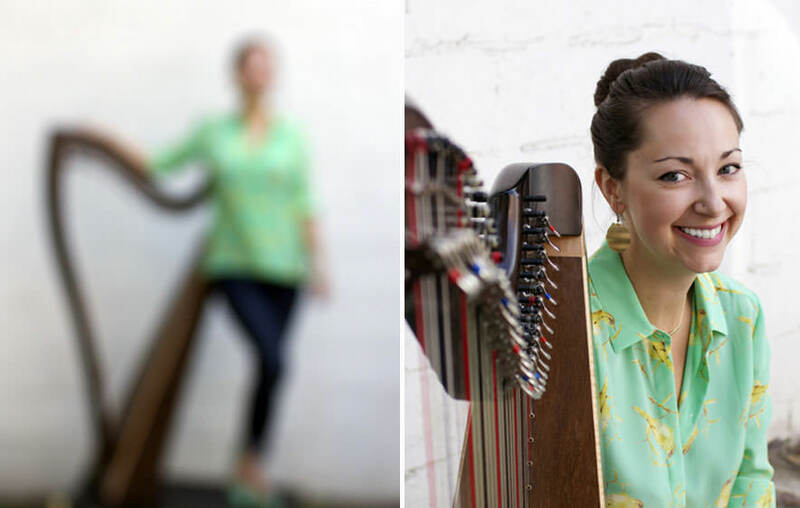 We did a bit of research on other harpists around the world and no one seemed to embrace the fact that the harp is a stunning instrument with class and elegance so we wanted to nail that idea down… with a twist. We were also very inspired by the classic French perfumes hence the logo and the flowers. Though you may see me dressed up at one of my shows, I am very down to earth; there is more to me than a girl in a gown who plays the harp. I value sillyness, I love to cook, I love being with my friends and family, I love being outside and I appreciate all kinds of art. I believe in equality. I believe that we all have a place on this earth and that no deed is too small. I believe in learning from your mistakes, striving to be a better person every day and I believe that everyone has a responsibility to contribute to this world. I try to play my part by sharing my art and passion with people in hopes that it may make them forget their troubles for that moment or perhaps even feel a little inspired. I am going to strive to let my art and personality shine on my website and social media so that you may come to it for a laugh, a listen, and maybe even some inspiration. Jessica- my designer, friend and neighbour. On her Birthday a couple of months ago, we were sitting with a glass of wine contemplating why work was slow that week and I decided that I needed to revamp my website and SHE was the one who was going to help me! She has been incredibly patient, on the ball, creative and hard working on this project. She made me feel so at ease and inspired. Thank you. Kara- my sister- She has always been the most supportive and loving sister a girl could ask for. She even flew to Vancouver from Winnipeg to help with the photo shoot. 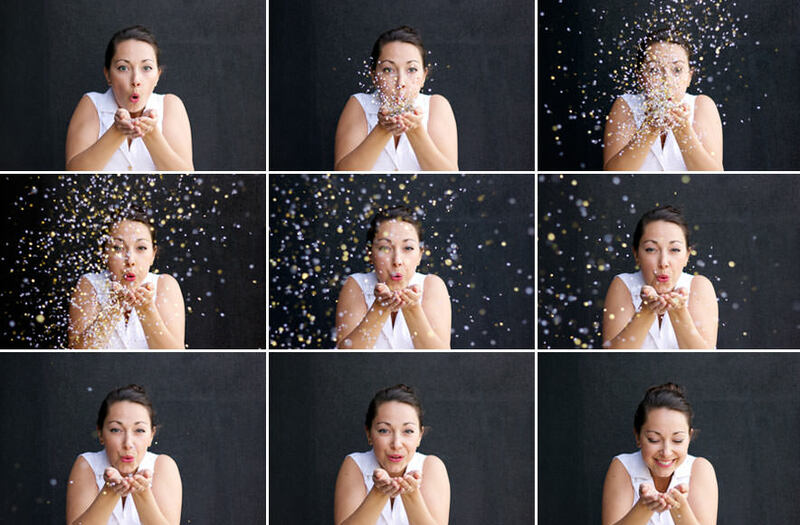 She took some amazing photos and helped me so much. Kara even ran to Whole Foods three separate times to get our treat: Green Goodness Smoothie. She helped edit and gave great ideas along the way. My sister is always so incredibly supportive and loving and I couldn’t ask for a better one. Thank you. My family- My parents and extended family are so supportive of what I do. I am incredibly lucky to have their love and support. My mom especially, is the one who reads, rereads, edits and gives her input. I am grateful for all that she does! Thank you. So ladies and gentlemen, I hope you enjoy this website and please come back to visit!